The recent dramatic intervention in the Brexit debate by the Speaker of the British House of Commons highlights the continued importance of a 643-year-old institution. But whether current incumbent John Bercow is upholding the office's honorable tradition of speaking truth to power probably depends on one's view of Brexit. The Speaker of Britain’s House of Commons, John Bercow, is all over the news in the United Kingdom at the moment. And, as the Brexit crisis rumbles on, he has become something of a YouTube star across Europe. 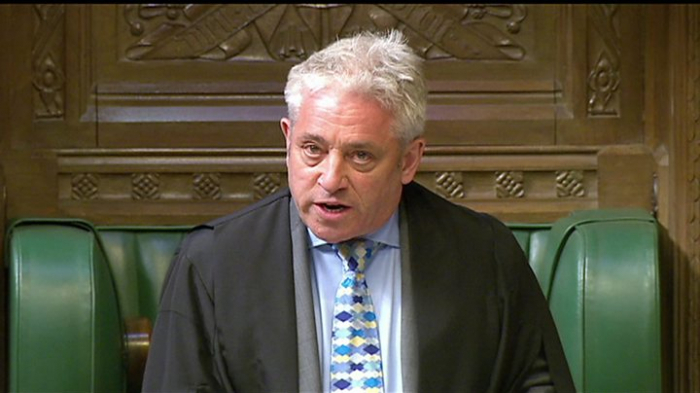 On March 18, Bercow revived a parliamentary rule from 1604 to prevent Prime Minister Theresa May’s government from bringing the same withdrawal agreement with the European Union back to Parliament after two earlier lopsided votes against it. The Speaker’s position goes back much further even than 1604. But, because Bercow’s intervention has changed the trajectory of Brexit, the office has attracted more attention than it has in a very long time. Where did the Speaker come from, and why was the position created during England’s so-called “Good Parliament” of 1376? Back then, the English parliament was already different from others in Europe, because it included a House of Commons with real power, most importantly over taxation. In 1376, the Commons strengthened itself significantly by electing a Speaker, so that it could speak “with one voice” and not be divided or picked off by the more powerful Lords. The country was in chaos at the time. King Edward III was senile, and his eldest son (the Black Prince) died during this parliament, leaving a nine-year-old heir. Meanwhile, a corrupt coterie was running amok at court. The Commons asserted itself by putting forward a Speaker, emphasizing that “what one of us says, all say and assent to.” It then invented impeachment in order to condemn the king’s corrupt advisers and his mistress, Alice Perrers. The Speaker took his authority from the group and insulated himself against personal attack with a “protestation” – making it clear that he was not speaking of his own accord but as a representative of others, and that his words could be “corrected” by his companions. The Commons originally elected a Speaker to help it speak truth to power, find strength in numbers, and resist intimidation. The voices of the less important were no longer drowned out or fragmented, and could challenge entrenched aristocratic authority. It was a political innovation that also inspired a new kind of poetry. Whereas earlier collections of tales such as Boccaccio’s Decameron had featured only upper-class narrators, the new role of Speaker fired the imagination of the English poet Geoffrey Chaucer, who was himself a member of Parliament in the 1380s. In particular, it informed the Canterbury Tales, a work that reflected Chaucer’s passionate belief that the voices of common people should be heard and preserved. By putting assertive, non-aristocratic voices – such as a cook, a sailor, a wife, a lawyer, and a rural parson – at the heart of his work, Chaucer broke radically with tradition. As the poem’s narrator, Chaucer borrows the “protestation” idea. He frequently tells us that he is simply repeating what his pilgrims said, and pleads with his readers to “blameth not me” if they find anything rude, offensive, or even revolutionary. And one of Chaucer’s pilgrims echoes the parliamentary Speaker by saying he will “make protestation” that he is speaking “under correction” of others. Chaucer included parliamentary scenes in other poems, most notably Parlement of Foules. The bird parliament in this poem is clearly influenced by the English one – it has common birds as well as aristocratic ones, and, importantly, the groups of birds pick representatives to speak for them. Whereas the upper-class birds talk endlessly and get nothing done, the forceful and vulgar lower-class birds take decisions and make progress. An interesting footnote to this story is Chaucer’s son, Thomas, went on to serve as Speaker in the fifteenth century, under the Lancastrian regime. He served in 15 parliaments, and was Speaker five times – walking a very difficult line with King Henry IV, who notoriously clashed with his eldest son, Prince Hal, in these turbulent years. Thomas repeatedly managed to maintain the Commons’ integrity without falling out of favor himself. Bercow’s recent intervention in the Brexit debate highlights the continued importance of a 643-year-old British institution. But whether the current incumbent is upholding the honorable tradition of speaking truth to power probably depends on your view of Brexit. Marion Turner is a professor of English at Jesus College, University of Oxford. Her book Chaucer: A European Life will be published by Princeton University Press in April. The original article was published on project-syndicate.org.